They got you. You’re allowed one phone call, but they’ll kill you during it. Who are you going to call? 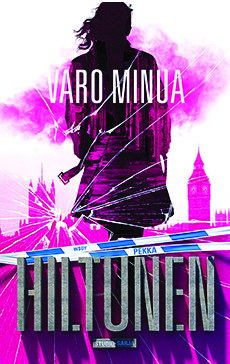 The double life of Finnish graphic designer Lia and her friend Mari on the fringes of the London criminal underworld is becoming dangerously entangled. Out of the blue on a normal working day, Lia is hauled in for questioning by the Metropolitan Police. The authorities have started to take a professional interest in the work – sometimes above and beyond the letter of the law – of Lia and Mari’s secretive crime-fighting organisation, The Studio. Mari responds to the challenge by harnessing The Studio to an operation that takes it inside the hard shell of the capital’s street gangs. Bloody turf wars are fought over control of every district and quarter. Before long, the Studio has to face a gang who execute with extreme brutality any who cross their path. Fear Me is a powerful, multi-layered psychological thriller blending the technical smarts of the mobile era with the rich history of London. It is a stand-alone work, and at the same time the third instalment in the author’s award-winning Studio series. “At times the story races in quite chilling ways, and as before, you have to devour the whole book until the end. (…) Strong women and an armchair trip to London, together with beautiful writing and interesting topics, that’s not a bad deal at all. There is one bad side to the book: you get to the end all too soon. More, please!” Nenä kirjassa Literature blog.